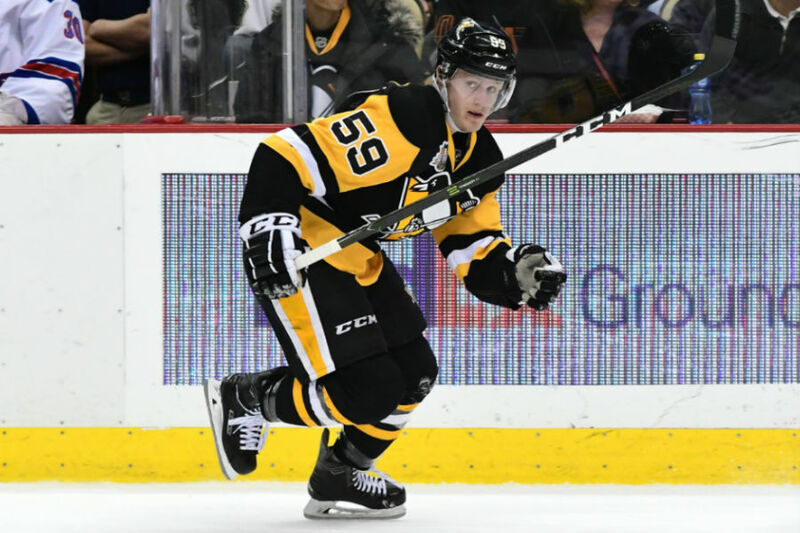 Jake Guentzel has been doing his best Sidney Crosby impression in the AHL, scoring 21 goals with 21 assists in 33 games while thoroughly dominating the competition in his first professional season. It was enough to earn a call up to the NHL team, his second of the season, and with little left to prove in Wilkes-Barre it's fair to wonder if this time it's for good. He'll have little time to get acclimated to the NHL though, as he'll be playing on Evgeni Malkin's left wing against the best team in the league for his first game back. Playing primarily with Malkin during his first stint in Pittsburgh, Guentzel started off his career with a bang, scoring his first NHL goal on his first shot during his first shift of his first game, then adding another later on for a two goal night. He finished with 3 goals and 1 assists in 5 games played, and based on his performance so far this year he should be adding to those totals before too long. Also called up was defenseman Chad Ruhwedel, who makes another trip up to Pittsburgh after Kris Letang was placed on IR with a knee injury. At the NHL level, Ruhwedel has chipped in a goal and an assist in five appearances on the season, and he's also been productive for Wilkes-Barre/Scranton, scoring 4 goals and 12 assists in 28 games with the AHL Pens.